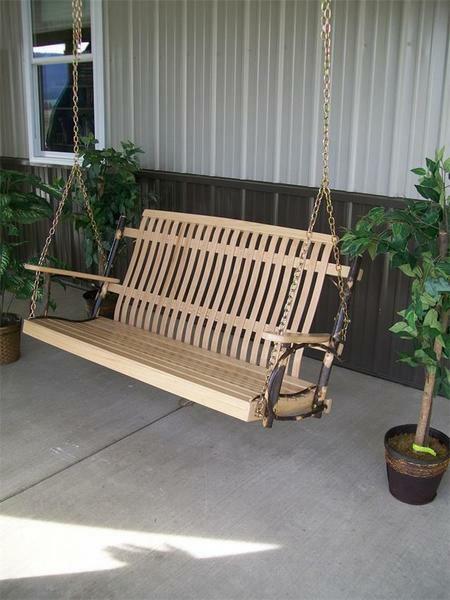 Bring a rustic look to your front porch with our Amish made Hickory Wood Swing. Create a space on your front porch for entertaining guests and enjoying family time. A cozy porch swing is the perfect spot for some cuddling or catching up. The natural outdoor finish on the swing brings out the rustic but beautiful look of the hickory wood. Call with questions on this hickory wood porch swing. We also offer our Hickory Wood Swing with a walnut finish. Note: The chain length is 7' which fit on a 9’ ceiling. Chain size can be increased upon request.